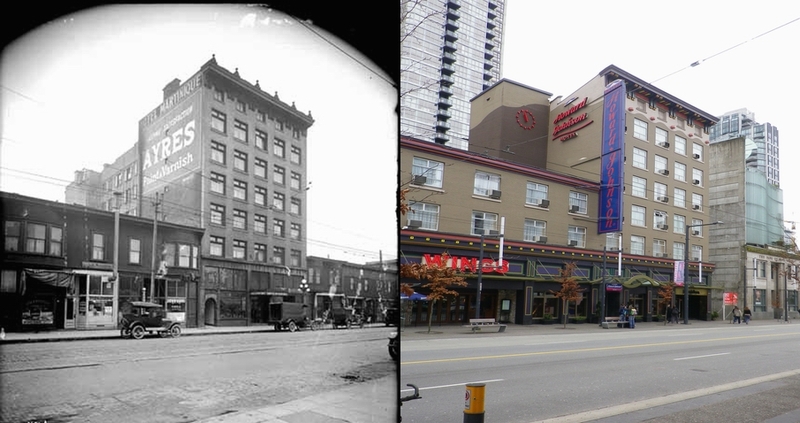 Another of the big hotels at the southern end of the Downtown stretch of Granville Street, the Hotel Martinique (seen here in a 1920 VPL image) was, like almost all the other buildings in the area, designed by prolific architects Parr and Fee. Although the building permit was issued in 1911, the building doesn’t look like it was actually constructed until 1912. It was built by J J Dissette at a cost of $100,000, and the architects knew their client pretty well – Charles Fee was the brother of architect Thomas Fee. Charles was born in Quebec and moved to Ottawa where he was in business with his brother-in-law trading in hemlock bark (used in the tanning industry). In 1911 Charles was living in the Gilford Street home of his brother, Thomas, along with Thomas’s wife and three children, Thomas’s mother-in-law and his wife’s sister as well as the household’s two domestics. Over the years the hotel saw several name changes, although it was called the Martinique through to the 1940s. As with many other hotels there were long-term residents. Harry Hemlow, one of the members of the first City Council in 1886, lived at the hotel for several years before his death in 1932. As with many of the city’s hotels, the Martinique had a beer parlour. In 1931 Mrs Rose Low was the licensee, (although George Low was the owner) moving there from the Empire on East Hastings before moving on to the Clarence three years later. During the 1970s the hotel was named the Blackstone, before becoming the Hotel California for Expo 86, complete with a fifty foot high mural. For a time it was on the list of single room occupancy residential hotels and then in the late 1990s, after a major makeover, the hotel became a Howard Johnson’s. 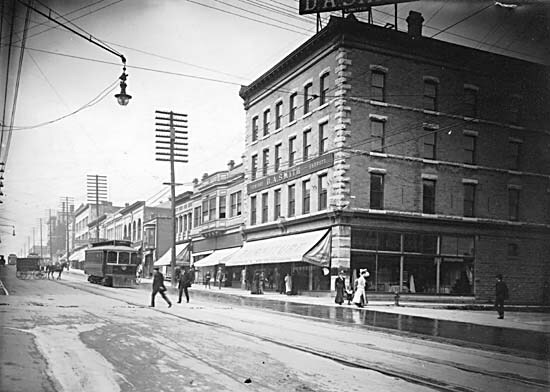 The building on the corner of Davie and Granville was most likely built in 1908, when it first appears in the street directory. There were three businesses when it was opened, the Northern Crown Bank, a Winnipeg based bank with three branches in the city and one in New Westminster who advertised with the statement “It is the only bank with a headquarters in the west. It is to the west what other banks are to the east”. It later merged into the Royal Bank, and by 1912 the Bank of Nova Scotia had taken over the Granville banking hall. Lester’s Hall was upstairs, also identified as Lester’s Dancing Academy, and on the corner Henry W Ferguson had his druggists store. Fred W Lester, an American by birth, lived on the premises with his wife Maud and daughter Dorothy and described himself in the street directory as a Dancing Master, although in the 1911 census he is a manager and she is a teacher of dance. By 1912, as well as the bank change, the Goodyear Tire and Rubber Co had moved in and W F Shumacker was operating a bakery. It’s unclear whether the building underwent improvements at the time, or whether Lester was thinking of moving, but in 1912 Thomas Hooper designed a Dance Academy for Prof Lester to cost $75,000 on Davie Street. In 1915 R T Garrow apparently worked on Lester’s Academy. Garrow was a Seattle architect whose other Downtown design involvement was as architect of the Hotel Georgia. In 1920 W E Fenn’s Dancing Academy had taken over and Browne and Beaton ran the druggists. Later the dance hall would be known as the Cotillion Hall before the St Johns Ambulance used it. Next door Walter Hepburn built the ubiquitous Parr and Fee’s design of the Granville Palace Hotel in 1909 for the Granville Land and Loan Co at a cost of $90,000. A year later the company spent another $15,500 adding a further storey. It appeared in the street directory for the first time in 1911, managed by A J Paterson and R M Morgan. S C Slattery had the Granville Palace Cafe in the front of the hotel. Vic Rollins sold his share in the Cranbrook Hotel in 1910 and the following year he moved to Vancouver to take ownership of the Granville Palace Hotel. A Judson Paterson was from Toronto, had worked as a telegraph operator and spent fourteen years with C P R’s Trans-Pacific Steamship Service. The Granville Land and Loan company who built the hotel was likely to be his idea as he was both Managing director and secretary-treasurer, and it was obviously successful as he lived in Shaughnessy Heights. Over the years the hotel became the Hotel Austin (as seen here in 1928) right through to the 1980s, and most recently the Ramada. The site on the corner of Davie was vacant for many years after the building burned down in 1969 – it may have been the first example of a “meanwhile park” after the site was cleared. In 1998 a new low, but rather elegantly designed retail store was completed to the design of W T Leung. 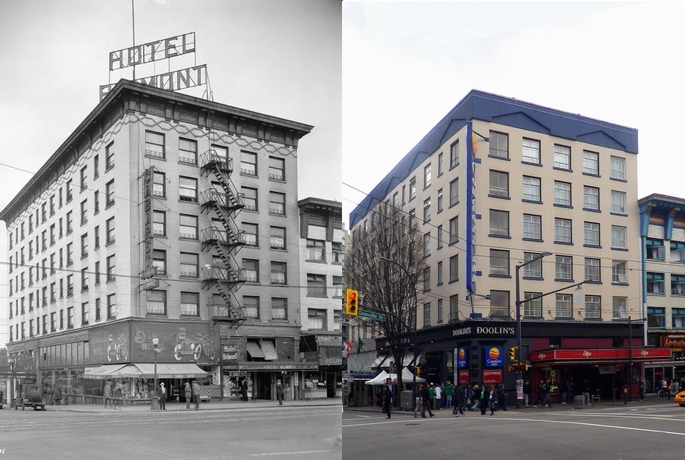 Only a few of the Granville Street hotels are still used as a hotel. 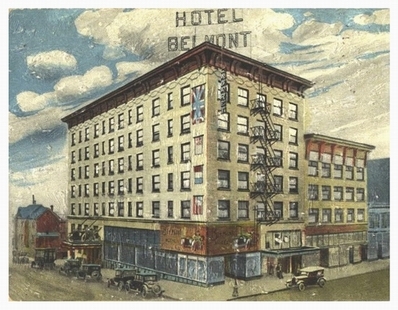 Here’s one, the Belmont, these days known as the Comfort Inn, and built as the Hotel Barron. In between times it was also the Nelson Place Hotel and the Hotel Dakota. 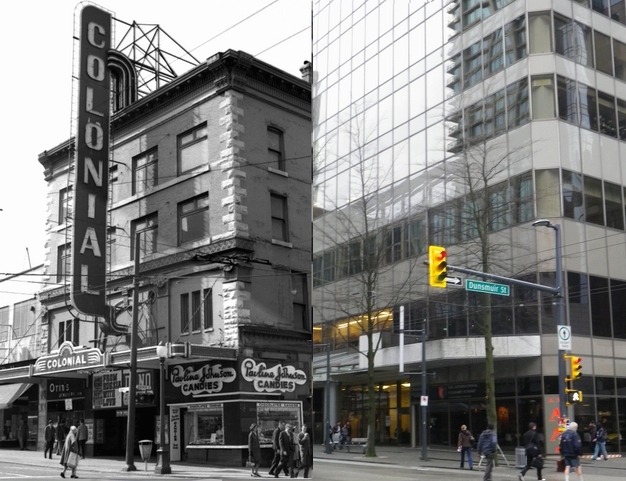 It’s now over 100 years old, having been completed in the rush of Granville Street construction that took place from 1909 to 1912. The Barron was one of the bigger buildings on the strip, and like most other buildings in the area, designed by Parr and Fee (like the Glenaird Rooms next door). Strangely, the developer, W H Forrest, claimed to be the architect when he got the Building Permit for the $90,000 building. Forrest arrived in BC in 1886 and his biography says he was ‘connected to the CPR’. Originally from Quebec, he lived in West Point Grey and enjoyed military rifle shooting as a recreation. The hotel’s builder, Walter Hepburn was also originally from Quebec, was, like Forrest, a former military man, and also listed his hobby as rifle shooting. We suspect that Mr Forrest acted as an agent for its real developer, Colonel Oscar G. Barron, owner of a string of hotels in the White Mountains of New Hampshire. He visited the area when his daughter was married in Seattle, and decided to build a hotel. Mrs O G Barron was shown running it with Mrs T S and T S Brophy in 1912, although we don’t know if she spent much time with the new investment. 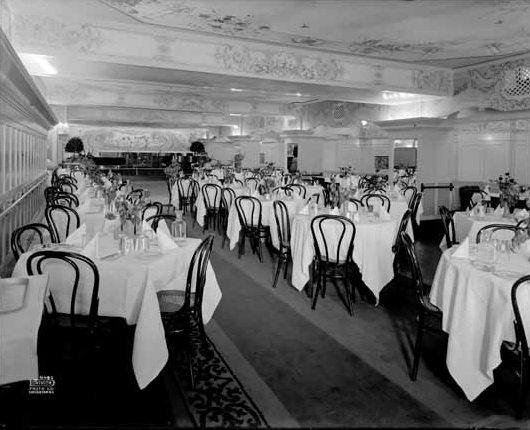 It offered “French Dinner Deluxe” in the Grape Arbour Room. The hotel seems to have had some long-term lodgers; in 1918 Captain Rorvik, living at the Barron hotel, signed a contract for W R Menchions to build him a new fishing boat giving the hotel as his address. It changed owners in 1926 and in 1932 when this image was taken the 21 year old building was known by its new name. The main floor in the picture included the Belmont Shirt Shop, the Belmont Cigar Stand, the Belmont Barber Shop, the Belmont Shoe Shine and the Belmont Grill. Around the corner on Nelson were the Belmont Cleaners and the Dom Dollar taxi company, with the Richelieu Cafe round the back. In the early 1990s the basement was a strip bar called Champagne Charlie’s, which was transformed into Fred’s Uptown Tavern while the beer parlour on the main floor became Babalu’s Tapas Lounge where Burnaby crooner Michael Buble cut his teeth as an entertainer. A 2001 kitchen fire saw both bars closed, reopened as Doolin’s Irish Pub and the Cellar Bar respectively. Here’s 1201 Richards Street in about 1900 in a picture held by Library and Archives Canada. The house seems to date back to about 1888, so it was a very early intervention into the recently-cleared forest landscape. Even by 1900, although the sidewalk has been levelled there’s still quite a drop to the street which hasn’t yet been raised. According to the census and the directories of the time, the house was owned by the Fletts. John H Flett worked for the CPR as a machinist, and his wife Isabella ran the house. The CPR moved into their Yaletown yards around then, which is presumably why the family moved there. It looks as if John and Isabella married in Lanark in Ontario in 1885 when John was 48 and Isabella was 42. She already had a son, Harry who had been born in 1878. In 1900 John Flett, aged 65, died in Vancouver. In the 1901 Census Isabella is the head of the household, and she has three young lodgers (aged 13 and a 15 and 20 year old brother and sister) as well as her son Harry living at home. In the directories Harry is listed as an apprentice with the CPR. In 1911 she’s still there, with three other lodgers, and street directories show her there until 1918. She may well have gone back to Ontario, where she was born, as an Isabella Flett died there in 1924 aged 82. Tracing the family is complex as there’s another family headed by a different John Flett who ran a hardware merchants in the city for many years, also tracing back to the 1890s. William Stock has moved into 1201 Richards from 1919 to 1922 when the address disappears – suggesting that’s when the house was demolished. 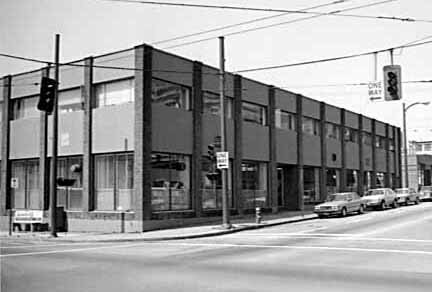 The address then switches to 500 Davie Street, and to an industrial use as the Ice Delivery Co make their home there from 1924 onwards, and in the mid 1950s the Domino Refrigeration & Ap pliance Ltd.
By the 1980s when this Planning Department shot in the City Archives was taken there was a standard two storey commercial building on the site, as there was in much of the Downtown South area. Following the new Downtown Plan of the early 1990s it became much more likely that the site would once again become residential, and in 2003 Bosa Properties completed Rafii Architects design for ‘Eden’, a 25 storey condo project with 177 units. Here’s a small wooden building, built very quickly after the 1886 fire, serving an important purpose as the recovering city’s Post Office on a very new stretch of Hastings Street. 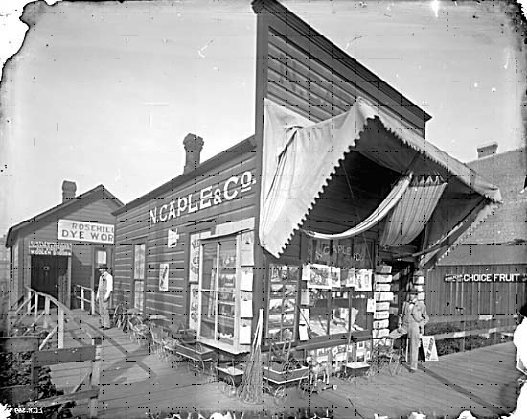 Actually this was the second location for the post-fire city post office, a shack on Carrall Street served the purpose while this building was going up in 1886 when the picture was taken. It was a bit off the beaten path – or rather the lumber path. This is one of the better pictures in the City Archives that show how the streets of the city were surveyed to be graded level, but reality took a little longer to come about. The distance from the sidewalk to the street was enough to ensure a broken leg, or worse, and crossing the street at this point was not an easy undertaking. Until some time later the only night lighting on the street was by carrying a lantern. Jonathan Miller was postmaster, and the citizens arranged a petition to complain about the inconvenience of reaching the location, it being so far out of town. That’s Burrard Inlet in the background, with no buildings blocking the view of the beach. A year later the Post Office had moved again (a block further west), and Bailey Brothers photographers had moved in. William Bailey joined his brother Charles who was responsible for many of the best images of the young city. He recalled the building in conversation with Major Matthews, “when I came here in 1890, there was nothing near that building, just vacant lots, a blankness. Right back of it was where Jonathan Miller, the first postmaster had lived, and a raised platform connected his dwelling to the post office at the time it was used as such. He must have lived there quite a time; a year or more after the fire; until the stone building in the next block up the street was built and in shape for occupancy.” The 1888 picture below shows Charles Bailey in the doorway. You can see the street hasn’t been completely filled in, even four years later. By 1890 another photographer and stationery store run by Norman Caple had taken over the building, and there was a dyeworks in a shed at the back. It’s not completely clear how long the building lasted. The Mahon Block, designed by W T Dalton was built next door to the west in 1902, and that forms two thirds of the building now occupied by Dressew. If you look closely you can see the brickwork doesn’t quite match on 327, and almost certainly this was built in 1913 by builder W Hepburn for Thomson Brothers, another stationery company, (and designed by W F Gardiner) but we can’t be completely sure as the numbering on this stretch of the street has been changed several times. The buildings have both been altered a lot too – assuming they are the original early 1900 structures (which they certainly appear to be inside) they’ve had completely replaced facades over the years; Dalton’s original building had a far more ornate design. 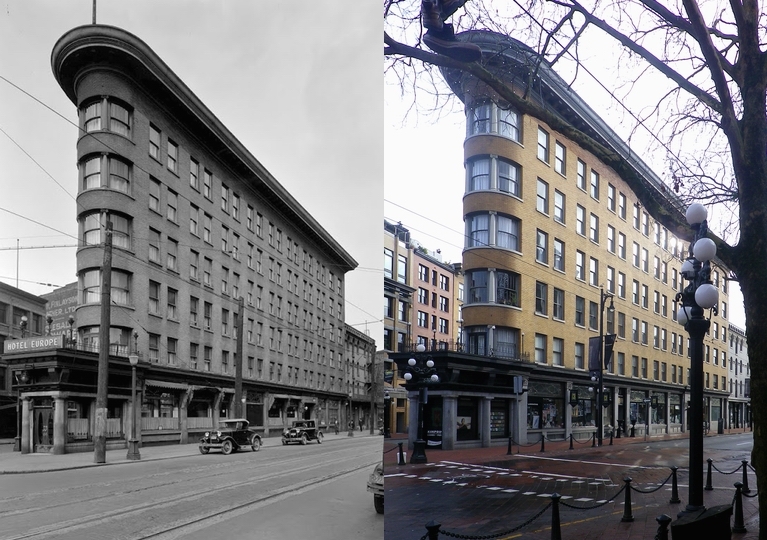 We saw the buildings that once sat on the south east, north east and north west corners of Dunsmuir and Granville already. Here’s the fourth corner; the south west corner. 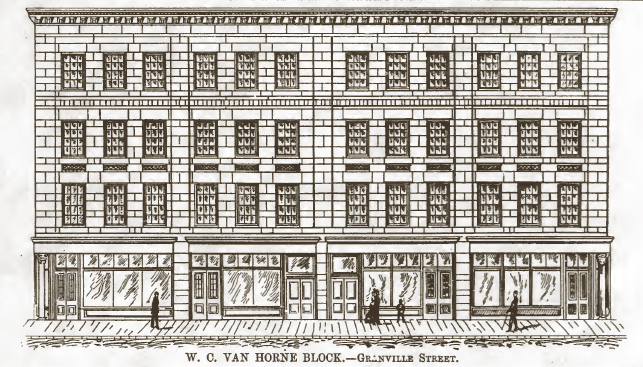 It held the oldest building of them all, built initially in 1888 as the Van Horne Building. Sir William Van Horne was President of the Canadian Pacific Railway, and there was no perceived conflict of interest for Sir William to acquire land and develop buildings on company property. It was in line with his responsibility to see the company’s investment pay off, so Sir William planned to build two buildings on CPR’s Granville Street holdings that were being promoted to drag the centre of the city westwards, away from its milltown origins. 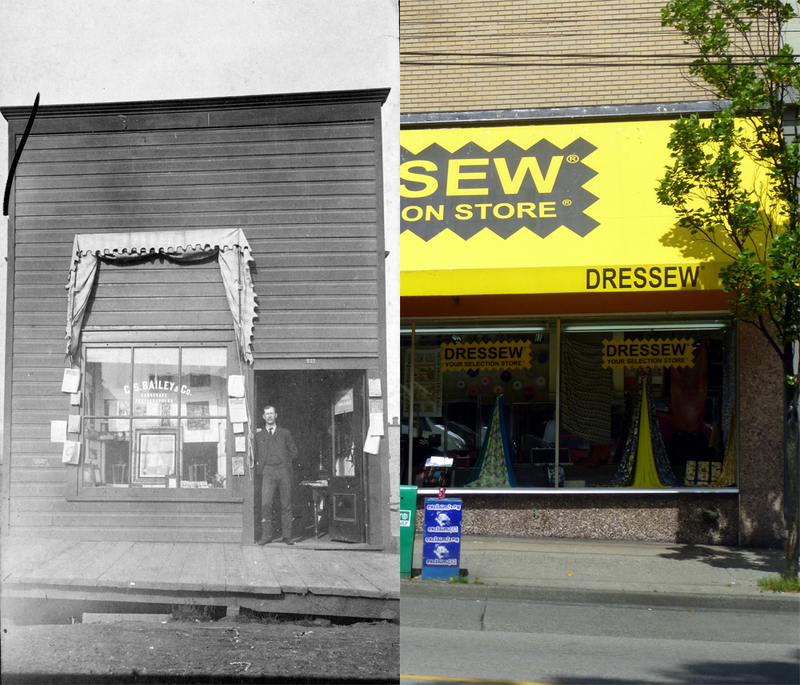 The first of his projects was on Granville Street at Dunsmuir, built in 1888 to the designs of Bruce Price. (Francis Rattenbury designed a second Granville Street building in 1903). Seen above in this 1887 illustration, it’s an impressive building for a one-year old city that just survived complete obliteration in a fire. Actually, the completed building was only half the size, but still impressive (as the 1909 VPL photograph on the right shows). The building lasted 24 years as an office, then received a dramatic $70,000 conversion to a cinema. The 1912 building permit was to the Ricketts Amusement Co and the architect was E W Houghton, a Seattle-based architect originally born in Hampshire in England (who had redesigned the CPR’s former Opera House in 1907). Ricketts, who came from the same county, was the former lessee of CPR’s Opera House (just down the street from the building, and despite its title, a mainstream theatre). Ricketts probably ceased connections with the building before its completion; he managed the Imperial Theatre before retiring in 1915. 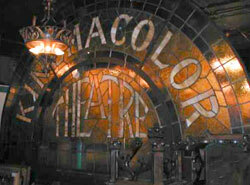 The 1913 opening saw the Kinemacolor Theatre offering movies, in colour – the first Canadian theatre with the system. Kinemacolor was invented by English cinematographer George Albert Smith, and marketed by American entrepreneur Charles Urban. Film was run through a projector at 32 frames per second, twice the normal speed, and then filtered through red and green coloured lenses to produce “the world’s wonders in nature’s colours.” A nine-piece orchestra accompanied the short films, and a baritone named George C. Temple “delighted the audience with some of the old songs.” Later, the theatre added a $10,000 organ to accompany the silent movies. The cinema failed to thrive, and was closed in 1914. The sign for the cinema remained however – perhaps because it’s 7 feet high and 13 feet wide. It mysteriously disappeared when the building was torn down in 1972 to make way for the Pacific Centre Mall, only to reappear in the Keg restaurant on Thurlow at Alberni, before it ended up removed from there too. The theatre reopened as the Colonial in 1915 with Hector Quagliotti as the owner and for a time became the most popular cinema in the city. The pianist from 1917 was Paul Michelin, “The man with the Million-Dollar hands”, who could, it was said, play over 12,000 songs from memory. He also incorporated other sounds for silent films including train whistles, steam engines, and battle scenes, but was criticised by the Musicians’ Union because he was doing the work of a sound effects man. Towards the end of its life the theatre incorporated the Pauline Johnson confectionery store, a popular stop before the main feature. In earlier years it was one of Con Jones ‘Don’t Argue’ tobacconists stores (“Don’t Argue – Con Jones sells fresh tobacco”). Today there’s a 1974 corner office tower of the McCarter Nairne and Partners Pacific Centre Mall – the colours ‘brightened’ from the more sombre earlier ‘black towers’ to the south. We saw the fabulous Parr and Fee flatiron building of the Hotel Europe before, but this 1931 angle really shows the delight of the flatiron solution to filling the site. The building was erected in 1908 for Angelo Calori, and is probably the first reinforced concrete building in the city. The other feature of note is the amount of additional clutter that has been added to the street. It’s winter, so at least you can see the building through the tree, but there are chains, bollards, clustered light fittings, coloured block sidewalks and banners on the streetlamps. The telegraph poles and tracks for the streetcar have gone though, and you can’t park all the way down the street anymore.